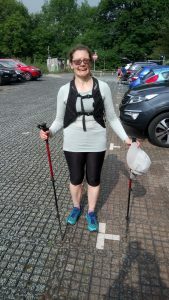 Training for the Lakeland Trails Ultra 55km on 8th July 2018 (which I believe from Angela White now, is actually 58km). Last Saturday we set off from Ambleside for the second time, hoping on this occasion to complete the full first half cutting back more directly from Grasmere to Ambleside covering about 40km. Heading up to Kirkstone pass there is a nice trail to begin with but unfortunately it comes out on the road just before the tortuous final punishment on concrete near the top. We hoped this time to find our way down the other side without taking a wrong turn but we still lost time as we went the wrong way around an old barn. Retracing our steps continuing to Hartsop we passed the first cafe which looked really nice. We continued on to Patterdale and Glenridding which was full of people enjoying a lovely day strolling around with Ice Creams. That was not for us as we drank our isotonic fluid and gobbled a chocolate bar. Then I think we went a bit wrong as we climbed very steeply past Lanty’s tarn, after which you can make reasonable progress. I have to say I did check the forecast before setting off – no rain. So I did not pack my waterproof, so obviously Ray lent me his and he got soaked when the heavens opened as we approached Grisdale Tarn. Again we probably descended too soon from the right of the valley to the left. Had we continued we would have found there was a bridge further up. Oh well only an extra 500m distance and 100m of climbing! The initial descent was not for running, well not by me but after that it was a lovely gentle path all the way to the Travellers Rest where everyone was sat outside drinking their beer. I had to pass by again and this time onto Grasmere which was crowded with tourists and cyclists. My reward was to shuffle as best I could up Red Bank, now my run was as fast as Ray’s walk. Once at the top there is the best view ever of the Langdale Pikes from Loughrigg with a lovely bench which sadly I could only admire. Near the end now, only need to skirt the lower trail around Loughrigg before a very steep descent back to Ambleside, where it was of course too late to go to the cafe. It will be touch and go whether I can complete it in the 12 hour time limit. I will be ecstatic with anything less than 11 hours. The average time for my age appears to 10.5 hours so time will tell if there’s life left in the old dog yet! I don’t know how you fell runners do it!